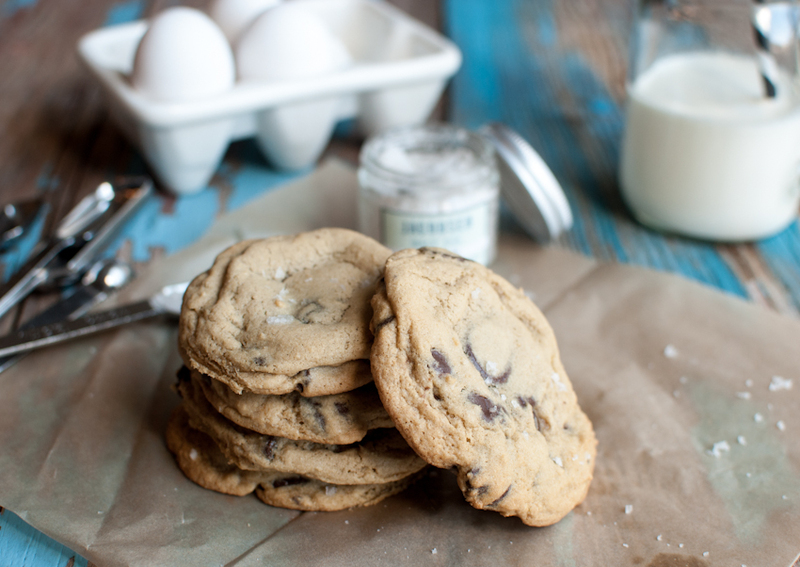 Sea Salt + Chocolate= Pure Bliss! On our recent stop at Red Hill’s Market, our favorite neighborhood cafe/store…I saw this Jacobsen Sea Salt Vanilla Bean jar. Say whaaaaatttt!! My first thought was to put some on my chocolate chip cookies, and then brownies, and then maybe chocolate ice cream, and then….. the imagination went wild! Of course I walked out of their with a jar, I couldn’t resist! The salt has a “real” vanilla bean in the jar amongst all that beautiful sea salt. And did I mention they are right on our Oregon coast? I’m all for buying local ingredients when I can! The salt pairs perfectly with dark chocolate, it’s the only chocolate I like to use in my cookies. I used some salt in the dough and also sprinkled on top of the cookie before putting in the oven to bake. 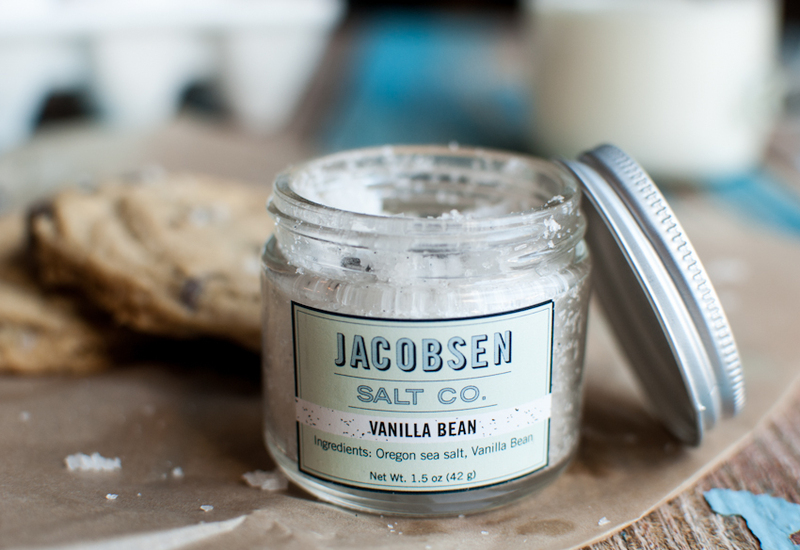 You have to get some Jacobsen’s Salt and give these a cookies a try! 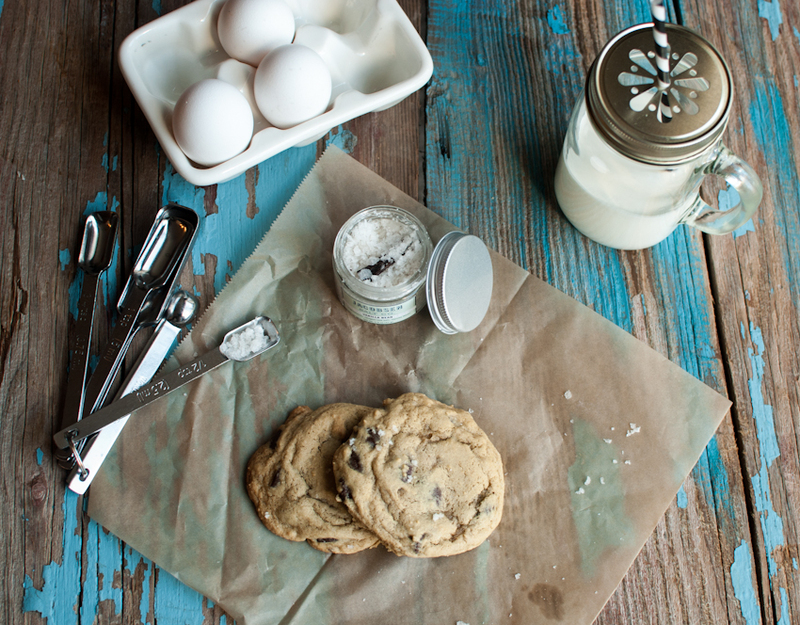 Warm gooey chocolatey salty cookies, you know you want some! In a large mixing bowl with the paddle attachment, or hand held mixer, mix the butter on medium high for about 30 seconds until soft. Add the brown sugar and granulated sugar, mixing until combined. Next add the egg and vanilla and mix until creamy. Add the flour mixture to the butter/sugar mixture on low speed, mixing until combined. Add the chocolate chips. On a parchment lined cookie sheet, scoop dough onto sheet placing about 1 inch apart. I use a cookie scooper to they are all mostly the same size. Sprinkle top with Jacobsen salt and bake for 12-14 minutes until lightly brown. Cool sheet on a wire rack before removing cookies from sheet,. Thank you! I think you can buy it on line at their site or I have seen it on Amazon, Cheers! Love the shots, Tiffany. I like your board too… I have stuff to make one this week, any tips? One side has to be all black but the other side I’m going to play with. My fav boards are the old beat up ones… maybe take a chain to yours and beat some dents into it? Or a dark red wash would be cool too!